A new Mobile App for teachers and students to learn English grammar. 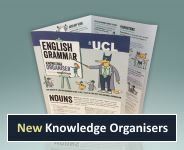 Knowledge Organisers, Flash Cards and Posters. The English language plays a very important role in the National Curriculum (NC). Great demands are made of teachers at secondary schools to teach complex linguistic and grammatical concepts, as laid down in the NC. Table 1 below summarises the main points of grammar required of students at Key Stages 3-5 (or, for English for Speakers of other Languages, Entry 3 to Level 2). These requirements are extremely demanding for both teachers and pupils. Most younger teachers know very little grammar and are suspicious of explicit grammar teaching. Not surprisingly, therefore, new recruits entering teacher-training courses typically either know very little grammar (Williamson & Hardman 1995) or have no confidence in their knowledge, presumably because they have picked it up in an unsystematic way (Cajkler & Hislam 2002). This situation raises obvious problems for the implementation of the official programme. Teachers also have a very limited period of time to plan and organise lessons, mark assessments, and so forth. Pupils at secondary schools also have difficulties with learning complex grammatical concepts. Typically invented examples are used in the tradition of grammar teaching. These examples are often simple but unrealistic. They find these difficult to relate to real linguistic settings and almost impossible to apply to their own language production. To address these problems we propose to create an English language teaching and learning platform based on our existing research. The platform would be specifically designed for teachers and students at secondary schools and delivered over the internet. The impetus for this proposal is a recent review of Key Stage 3 Grammar Teaching, published by DfES in 2007, which concluded that teaching should make use of formal and informal English in different settings, and that grammar teaching must be driven by real examples. We will construct a web-based teaching and learning platform consisting of an interactive structured English language course, tailored to the goals of the National Curriculum’s Key Stages 3-5 (see Table 1). This will consist of lesson modules dynamically accessing a grammatically analysed corpus of English. Provide quality Continuous Professional Development (CPD) resources to enable teachers to make the most of the resource. Our partner is the School Improvement Service of the London Borough of Camden. Material can be selected for a particular student group or purpose (e.g. to teach students the features of formal English, or how to write a letter). The proposed platform will have a modular design to provide a very high level of adaptation for teachers and students. 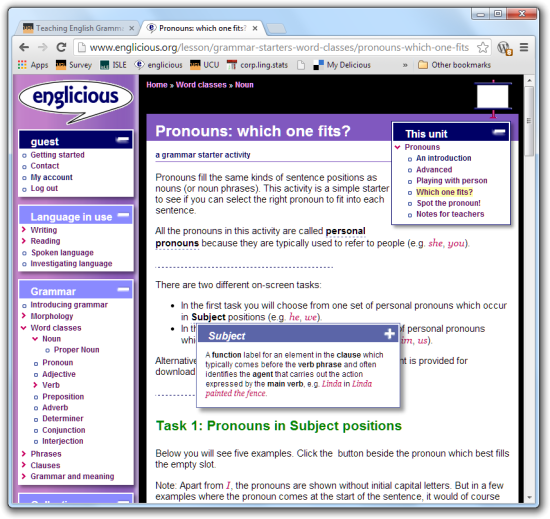 Course materials for English language students at Key Stages 3-5 and equivalents used in the classroom by teachers or in a self-directed mode by students working alone. 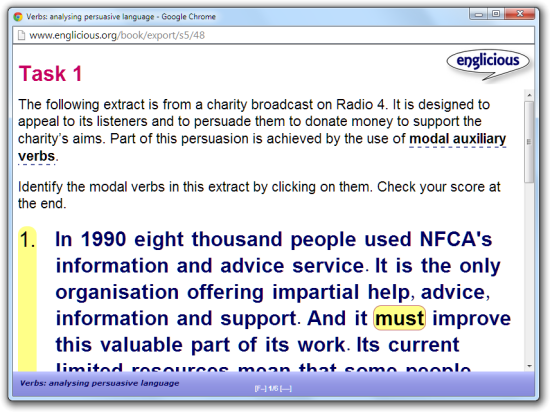 Examples will be sourced directly from the corpus providing context, alternative examples, etc. Technical documentation, including the interface to the corpus management system. The main beneficiaries will be teachers and students of the English language in the local community, but with the long-term aim of producing a resource that is available across the UK. Teachers will benefit from the availability of pre-written, but flexible and adaptable, courses and modules for building their own course plans. They will be able to access corpus materials, including texts and audio recordings. Students will benefit through the acquisition of grammatical concepts being made relevant to them through lessons and interactive hands-on exercises. Teachers can select source materials and determine a set of possible lessons, exercises and student projects. The resource will be will be compliant with the Special Education Needs and Disability Act (SENDA), and can also be used for the following categories of students: ESOL students (English for Speakers of Other Languages), ‘Skills for Life’ students, and Adult Education students. The use of web technologies is designed to maximise access from schools, libraries (via the People’s Network, www.peoplesnetwork.gov.uk), and home. The entire development system will be available over the internet from UCL and requires no additional software at the user’s end, aside from standard internet browser programs. This will enable the community in general, and teachers and students of English in particular, to gain access to the system. more advanced reported speech, question tags, etc. modals for past obligation, etc. Hudson, R. and J. Walmsley (2005) The English Patient: English grammar and teaching in the twentieth century, Journal of Linguistics 43.3, 593-622. Quirk, R., S. Greenbaum, G. Leech and J. Svartvik (1985) A Comprehensive Grammar of the English Language. London: Longman.